For me, it’s strictly the curiosity factor. Kinda like when I heard that Russell Crowe was in “The Man With The Iron Fists.” I mean, the guy’s an Academy Award winner. What the hell was he doing in a Kung Fu movie? That’s the same reaction I had when I heard about WORLD WAR Z. I mean, Brad Pitt’s a guy who’s been nominated something like four or five times for an Oscar and he’s won a Golden Globe. Moly Hoses, what’s he doing in a zombie movie? I’ve heard that he did it primarily because his sons wanted to see him in a zombie movie. I dunno how true that is but I do know that WORLD WAR Z may just be the first family friendly Zombie Apocalypse movie. Seriously. This is a horror movie you can sit down to watch with the whole family. The Earth is infested with a global outbreak of what can only be described as zombies. They run around like roadrunners on crack, spreading the plague faster than the nations of the world can mobilize a response. Israel closes her borders. No word at all comes out of India and Russia and its assumed they are lost. Former United Nations investigator Gerry Lane (Brad Pitt) and his family barely escape Philadelphia before it is overrun with zombies. They are taken to an aircraft carrier parked some 200 miles off the coast of New York City and Gerry is pressured into helping investigate where the plague began as any hope of finding a cure lies with the origin of the disease. From there, Gerry hopscotches around the world, from South Korea, to Israel and to Wales on the track of the cause of the Zombie Apocalypse, staying one step ahead of the tidal waves of zombie hoards and desperately trying to save what’s left of the world and his family. 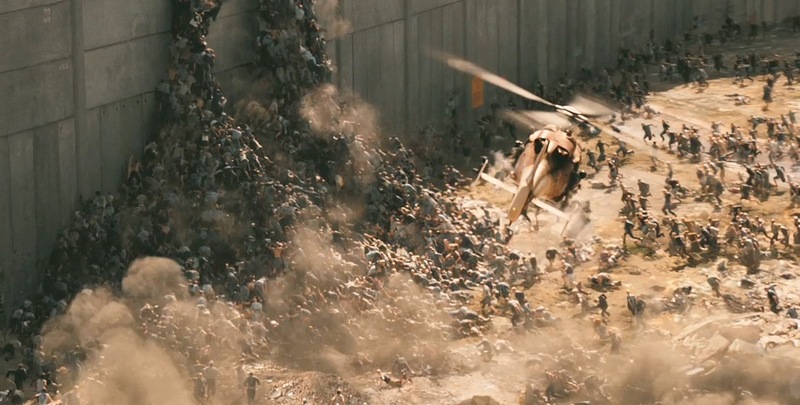 WORLD WAR Z is without a doubt the most bloodless Zombie movie I’ve ever seen. Those of you reading this who are fans of “The Walking Dead” are going to be disappointed with this one. There’s no gore, no bodies being ripped apart. No long, lingering shots of Zombies munching on screaming human appetizers. Oh, we see people getting bit but nobody gets et. Or even eaten. Zombies are taken out with head shots, sure, but there’s no brains and blood flying around. When skulls are bashed in the baseball bats and crowbars don’t have any blood dripping from them. There’s one character who has to have her hand cut off in order to save her from being infected and there’s no gouts or geysers of blood that we have a right to expect. Did I mention that this is Brad Pitt in a zombie movie? The zombies in this movie are Boyle Zombies, not Romero Zombies. By that I mean they act more like The Infected of “28 Days Later” and “28 Weeks Later.” They run fast enough to make Usain Bolt look sick and they swarm in packs like locusts. 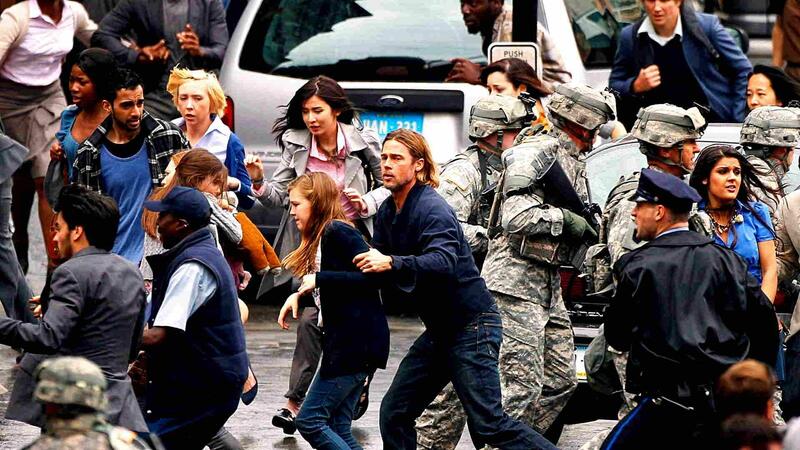 But for all their menace, the violence in WORLD WAR Z is relatively mild. Seriously. You’ll see more horrifying, gory violence in any given episode of “The Walking Dead” than you will in this movie. Matter of fact, most of the time we see enormous packs of zombies swarming over walls and running through streets and over rooftops, not chomping on folks. It isn’t until the suspenseful final level of the movie where Gerry and two others have to very quietly sneak into a medical complex overrun with zombies that the director Marc Forster really delivers some scares. I’m not much of a fan of Forster’s directorial style and there’s nothing he does here to change my mind. He’s yet another director who’s in love with shaky-cam because it’s easier for him to swing the camera around wildly instead of storyboarding coherent action sequences. But I liked the video game aspect of the movie. Gerry’s going from country to country is akin to him going through the different levels of a video game as there are specific tasks he has to accomplish every place he visits before he can advance to the next. And each level comes complete with a different set of supporting characters, each of who have specific tasks of their own that help Gerry accomplish his. Brad Pitt is better than he has to be for a movie of this nature. He doesn’t play a two-fisted, guns-a-blazin’ action hero. He’s a committed family man who loves his wife and children deeply and that’s the note he plays through the whole movie. Mireille Enos plays Gerry’s wife and I was really sorry to see her stuck on the aircraft carrier for most of the movie as during the early scenes she demonstrates that she’s no shrieking fishwife. She’s just as capable and resourceful as her husband during this hellish crisis. Daniella Kertesz is terrific as an Israeli soldier who joins Gerry in his mission. So should you see WORLD WAR Z? As I said earlier, this is a zombie movie that you can take the whole family to. I say that because of the strong family aspect of the movie that motivates the Brad Pitt character and the relatively moderate violence level of the movie. This is a PG-13 movie, after all. It’s not a movie I’d say you have to see but if you elect to do so I don’t think you’ll feel that your time was wasted. 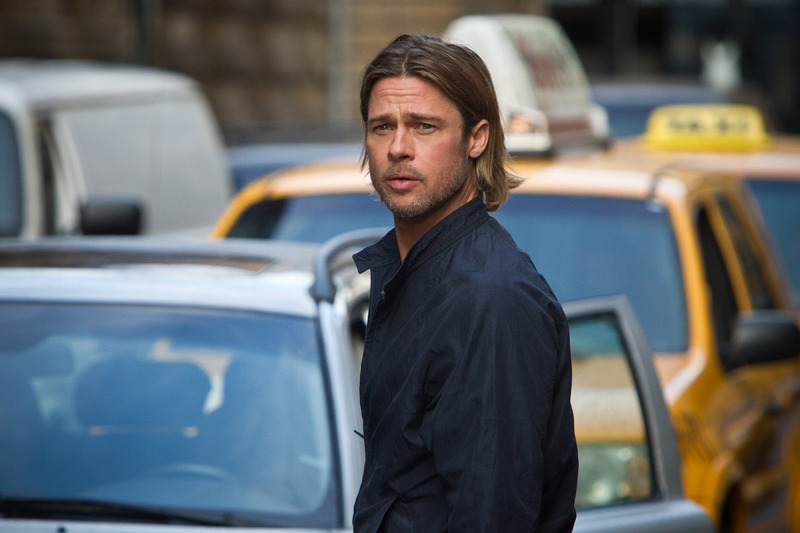 And do you really want to miss out on seeing Brad Pitt in a zombie movie? I enjoyed the film and its take on zombies. Though I didn’t really understand why they avoided the people they did. 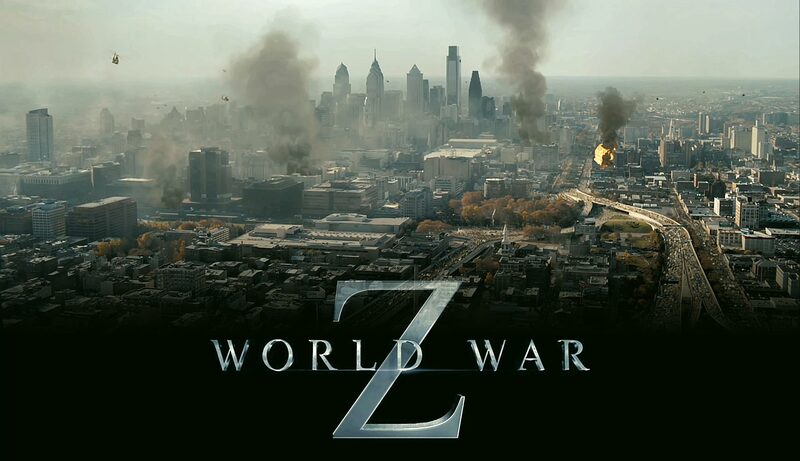 The biggest thing that let me enjoy the film though was pretending it wasn’t called “World War Z”. As an adaptation of Max Brooks’ novel it fails on every level. That’s my secret for a lot of movie adaptations of other source material. “Based on” rarely means “exactly like”, and I’m okay with that as long as I go in with that expectation. That said, the film does feel misnamed, because the zombie-pocalypse is not really presented as an actual war (as it is in the book). The lack of gore was something I picked up on as well. I assumed it wasn’t a deliberate attempt to avoid the tropes of previous zombie films so much as a deliberate attempt to avoid an R rating. That said, it also fits with the conceit that the film is written more as a global(ish) apocalyptic disaster film than a horror film.